The error code 0xc000000e means that the current bootable device cannot be found on the selected interface. This means that the wrong mode is set in the bios for a Sata-based hard disk. If the error 0xc000000e occurs when starting Windows, it simply means that you are dealing with corrupted boot configuration data. The boot configuration data is a global memory for all boot options and settings on new Windows PCs. You receive this error message when you try to start your device and you will see a black screen with instructions on how to repair your computer using an installation floppy disk or a recovery drive. One of the most common causes of this error is the BCD, which is missing, damaged or incorrectly configured. This may occur due to hard disk write errors, power failures, boot sector viruses, or errors in the manual configuration of the BCD. File system integrity is compromised. For the same reasons, the file system can be corrupted. This happens even more often when you turn off a PC while it is writing important data for the boot sector. When your computer starts, wait until the manufacturer’s logo has enabled the boot menu option, usually F12. The start menu button may differ from one manufacturer to another. If you cannot find the start menu button, you can refer to the user manual. Reboot the computer when the manufacturer’s logo appears, press the boot menu option button to access the boot menu and change the boot option to a CD-ROM. After starting your computer with Windows 10 DVD or System Repair Disc, a black screen with gray text “Press any button to boot from CD or DVD” appears. Press any key. Choose the right time and type of keyboard. Click Repair Computer in the lower left corner. Click Troubleshooting, click Advanced, and then click Auto Repair. 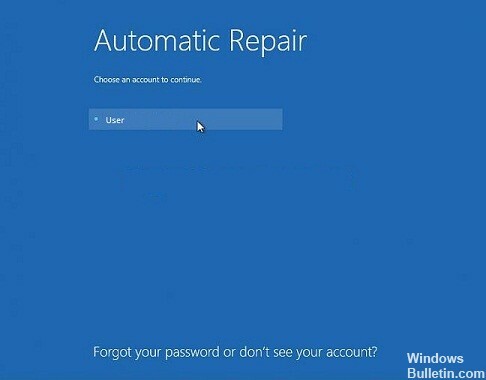 Repair your operating system with the recovery drive. 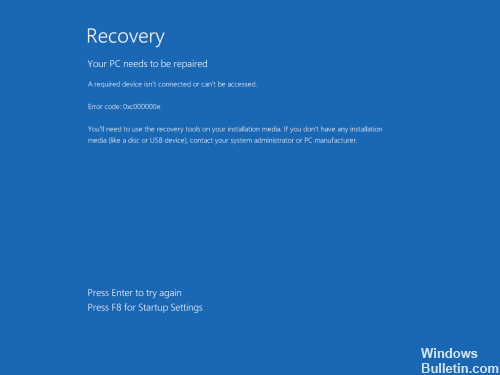 This method also repairs your operating system with the recovery drive command prompt, and you should be able to boot under Windows without having to fix the problem again. Boot from the recovery drive and follow the instructions below. Use steps 1 to 3 of the previous method to access the recovery drive prompt. At the command prompt, type the following commands, followed by an entry on your keyboard to execute them. The StartRep.exe utility corrects the boot environment values and should correct the BCD error. Note that you may need to repeat this step several times if it fails. If the previous Windows repair step did not help, type bcdedit in the command prompt to display the Windows boot manager values. Note the values for Device. If they are unknown, enter the following commands followed by an Enter to execute them. Note that you may need to replace C: with the partition on which your operating system is installed. Also, if you have any questions or additional solutions regarding the ‘0xc00000e’ system error in Windows 10, please let us know in the comments field below.